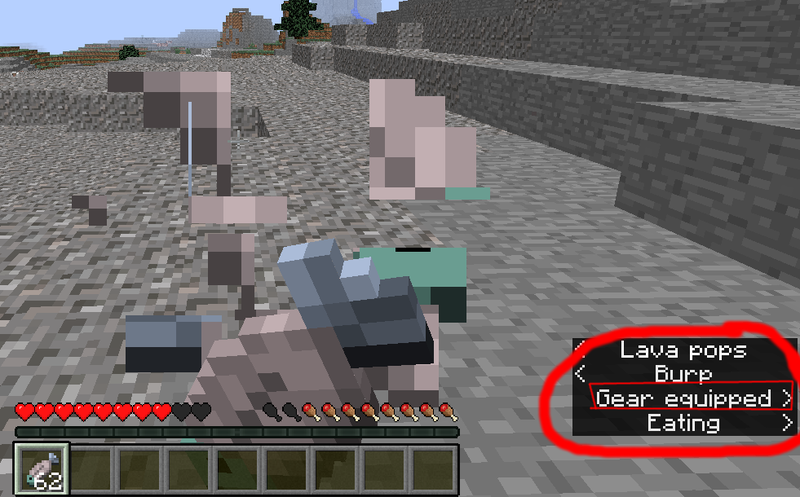 My sound breaks every here and there, so I use the new Minecraft feature added in the release 1.9: Subtitles. I already learned to use them, but sometimes they surprise me by what they write, like "Enderman vwoops". It says something equipped some gear (armor) when I eat. I didn't manage to hear the sound while eating (if there is any). So, is this a bug (does the game think I'm equipping some gear), or is this on purpose? Also I sometimes see "minecraft rolls". I'm playing on vanilla Minecraft version 1.10.2 and I didn't notice this in any older version. "Gear equipped" - When throwing a splash potion. "Gear equipped" - Eating something, tested with many food items. "Minecart Rolls" - Suggested that it happens when a chunk with a Minecart is rendered, even if the Minecart can't be seen. I keep dying when I'm mining Obsidian on Minecraft. Why? Why does Minecraft on PC keep saying that it can't connect to a server? MineCraft Wolves: why are mine completely white? Why does my minecraft sprint stop when hitting an entity? Why isn't Minecraft letting me eat?